Cut wonton skins in half diagonally. In 12-inch skillet, heat 1 cup oil over medium heat until hot. Fry wonton skins in batches, 1 to 2 minutes per batch, until golden brown and crispy. Drain on paper towels. Cool and discard oil. In 8-inch skillet, heat 1 tablespoon oil over medium heat. Add green onion whites, garlic and pepper; cook 1 to 2 minutes, stirring occasionally, until softened. Stir in crabmeat, cream cheese, lemon juice and soy sauce. Cook over medium heat 3 to 5 minutes, stirring occasionally, until heated through (at least 165°F) and cream cheese is melted. Remove from heat. Top with mozzarella and Parmesan cheeses. Cover and let stand 3 to 5 minutes or until cheeses are melted. Top with green onion greens; serve with wonton chips. No time to fry? Skip the wonton chips, and serve the dip with tortilla or pita chips. 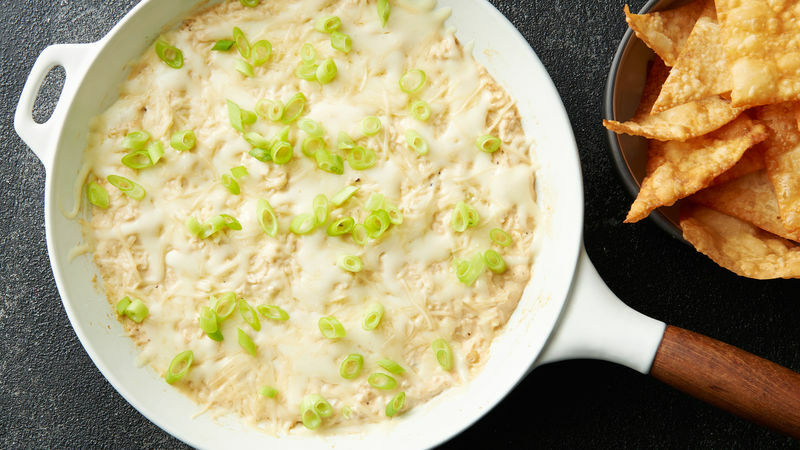 This dip looks great served in a cast-iron skillet, but stainless steel works just as well.